First time I've ever broken a phone, and it was my favorite. Dropped my note 8 onto cracked rocks today and shattered the screen. It still works and charges, but the screen is flashing and of course a few deep cracks. I checked with Verizon on options and they showed I owe $290 on this phone. So I can pay that off and use my upgrade. Didn't want to use my wife's upgrade as she is about to finally get a new iPhone. They did waive any upgrade fees for me though. My question is do I get another N8, or do I go with the N9 now? It's roughly $4-5 difference per month it seems. Did not have phone insurance either. Wondering if I should look into it now through Verizon/Asurion. Note 9 has stellar battery life and if you use the S-Pen a lot then the new one has a few more tricks up it's sleeve. Good luck. With only 8 or 9 payments left, I'm trying to decide if I should just wait and get a new note 10 when they're released. Look into squaretrade.com and see if that insurance better for you! Win! Verizon is paying half of my phone off and I'm only responsible for the other half. I can upgrade to a note 9 tomorrow and they waived my upgrade fee. Sometimes you just get the best rep! Bobbert9, jimd1050, JHStewart1023 and 2 others like this. Hell, in that case, hold tight for the 10. Wonder how much I can sell this note 8 for? It still functions fully other than the cracked screen and discoloration on occasion. Case, box, unused headphones, and charger. If someone fixed the screen (which I may should have looked into) they'd probably have a near mint condition phone. Good for you, bro. The screen WILL get worse, trust me. I'm glad you got it figured out. Everything I h eww ar about the Note 9 is highly positive and a lot of those come from previous Note 8 users. I love my Note 8 and I can't imagine anything being better but apparently the N9 succeeded in that. I won't be getting the 10 - I will never get a notched phone OR one with camera holes drilled through the display. That killed it for me. I'll keep my Note 8 until it stops doing everything I need it to. jimd1050 and iSilas like this. Just traded my Note 8 in for a Note 9 on Nov 2nd with the Samsung $600.00 Off Deal - LOVE IT! See how much you can get the screen replaced for and then sell it as a working phone instead of taking a complete hosing on selling a piece of junk. Check on Swappa and see what the Note 8's are going for then determine what (or whether) it's worth spending to repair it!!! 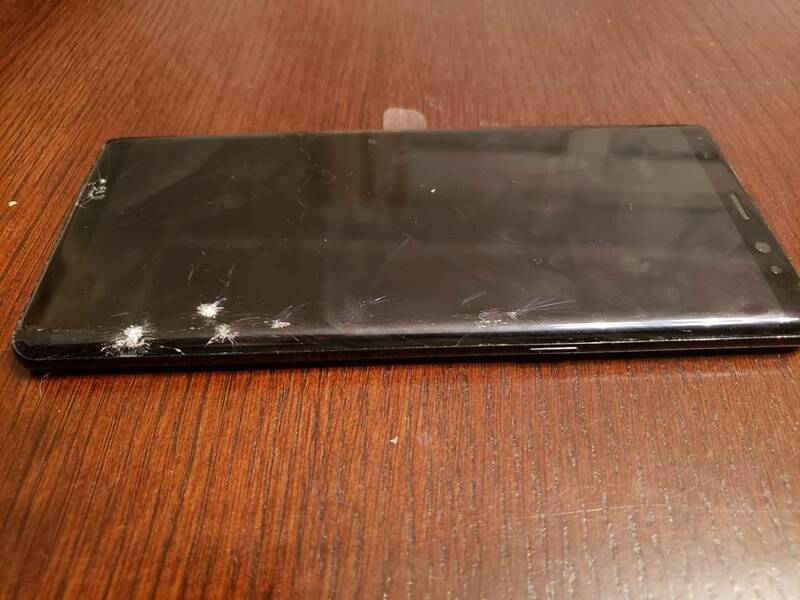 That happened to me, but i have the verizon insurance and paid like 40 bucks i think to have a mobile person come to my job and replace the screen. Looked like new when he finished. I ended up getting the Verizon insurance for $13 this time. Never cracked a screen but this made me change my mind. $100... maybe. Because you buy it for a $100 and pay about $250 for a screen replacement at ibreakifix ($250-$300? I forget) then you put in about $350-400 into it and I think used Note 8 could be had around that undropped and in pristine condition.